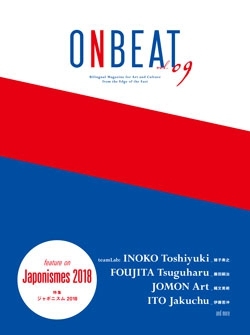 ONBEAT is a bilingual art magazine which introduces Japanese art and culture. Vol.09 features a big cultural event now being held in France, Japonismes 2018. This government-led event introduces not only the well-known traditional Japanese art but also the ‘unknown Japan’ of today. Some of the main programs of the event as well as the exclusive interview with the President of the Secretariat of Japonismes 2018, Hiroyasu Ando of the Japan Foundation are featured. Vol.09 also contains an interview with Toshiyuki Inoko of the ultratechnologists entity, teamLab, which recently opened its first museum in Odaiba. A special article by internationally renowned archeologist Dr. Simon Kaner will provide readers further insights on Jomon art, which attracts much attention after the exhibition on Jomon in Tokyo this summer. An article on the exhibition “Foujita: A Retrospective” will serve as an excellent guide for the exhibition.